David Victor, Chairman of Southern California Edison's hand-picked Citizens Engagement Panel, made a statement to the NRC about how things have been going for the six-month old panel thus far (URL for a copy of his statement is shown below). Probably the most disgusting thing about Victor's statement is his first topic: That he thinks there's an overemphasis on the spent fuel! Nuclear waste is still being produced at Diablo Canyon and 98 other commercial nuclear reactors around the country, and our problems with spent fuel here at San Onofre will last for thousands of generations. Despite closing four reactors last year (including San Onofre's), America's commercial fleet of nuclear reactors is still producing about 10 new tons per day of nuclear waste - but not right here, not at San Onofre. However, we still have nearly all the waste that ever was produced at the plant, and that's millions of pounds of highly radioactive "used reactor cores." The waste needs to be safely stored for thousands of years. To do that, it needs to be moved out of an earthquake and tsunami zone. But before that can possibly happen, ALL the other reactors have to close, too. So Victor is wrong. The spent fuel nuclear waste is THE problem that he volunteered to work on. The rest of the reactor can be left to sit for 50 years or more -- it's an eyesore, but it would be a lot safer for the workers who will eventually demolish it the longer we wait to do so. If we wait, they would get on the order of dozens of REM of radiation cumulatively, whereas, if they demolish it during the next decade, it will require about 20 times more exposure to the workers (hundreds of REM). If SCE is allowed to begin demolishing the plant as soon as possible, the workers will get far more exposure than the same number of workers would normally get in the same number of years at an operating nuclear power plant -- unless something goes very wrong there, like at Fukushima, where 50 workers who stayed were highly irradiated (their leader has already passed away) or Chernobyl, where 600,000 military conscripts were forced to help clean up the mess, and the cancer rates soared among them afterwards. Except for the spent fuel, the rest of the reactor site has ZERO urgency about it: Waiting not only lowers the worker risk, but it can lower the cost because the less radioactive the materials are, the easier and cheaper it is to dispose of them. Perhaps best of all, waiting (known formally as "SAFSTOR," which stands for something but simply means waiting) greatly reduces the amount of radioactive debris which is released into the local environment. But the spent fuel -- that's another story. Waiting might be absolutely disastrous. The fuel consists of pellets about the size of a pinkie bone. The pellets are stacked in a vertical tube about 14 feet long, and about 250 of these tubes are bundled together in what's known as a fuel assembly, and about 250 fuel assemblies are put into the reactor at one time. When they go in they are "mildly" radioactive and can be handled with cloth gloves. When they come out, about 5 years later -- watch out. You couldn't even ride by them on a motorcycle at 60 miles an hour without absorbing a lethal dose of radiation. And that's from just one pellet. If that one pellet were to burn (it can), it would release enough plutonium and uranium to render the "host community" (San Clemente) completely uninhabitable for hundreds, or even thousands of years. Alternatively, somebody might spend billions of dollars in remediation (which might mean pushing the top layer of soil, and all the structures, in all of San Clemente, out into the sea). The radioactivity in one spent fuel pellet is probably more radioactivity than San Onofre has released during its entire life-span, including whatever will be released during decommissioning (assuming nothing goes wrong). Spent fuel is very, very concentrated poison! There are hundreds of thousands of fuel rods stored at San Onofre right now. So if Victor wants perspective, let him chew on that for a while (or he can chew on a fuel flea, if he prefers). Victor's next concern for the NRC is that there is too much concern on the part of the public about "high burnup fuel" (HBF) and this heightened concern could lead to "paralysis -- especially paralysis induced by regulatory uncertainty or delay." Oh, THAT again -- exactly what SCE says killed the plant in the first place (not their blundering mistakes, no). So Victor is quite the company man. And he is sure any decision to "can" the HBF will be due solely to "regulatory uncertainty," which could have been called, "even you can see the writing on the wall." Worse, he talks out of both sides of his mouth. He says it's important not to make decisions that lock in wrong processes, yet doesn't seem to realize that the decisions he's making will matter to his children's children's children's children's.... children. I think he expects the panel to disband early in 2015 or something! Maybe the worst part is where he describes the lying, slanderous bullcrap fed to him (and the rest of the CEP and the public) by the AREVA spent fuel dry cask canister salesperson as "reliable testimony at one of our workshops" (at least that's presumably the "testimony" he's talking about, although calling anything at these workshops "testimony" is inaccurate, at best, since no one is under oath). Victor also seems to have little understanding of what the different design options might (or might not) accomplish, referring to 24-assembly casks as "low assembly casks" while the 32-assembly casks are simply "denser more modern cask designs." He claims, while clearly having no experience in the matter, that the higher density casks will be "easier to protect" (from sabotage, presumably). Such a claim ignores the fact that a single breach of a single cask will do at least 33% more damage, all other things being equal, since a high-density cask holds 32 assemblies instead of 24 -- and it ignores the fact that the higher density packs would be more easily -- or at least more extensively -- damaged by the turbine shaft of a jumbo jet, which will cut through the cement and steel overpacks like a hot knife through butter. When Victor talks about a smaller "footprint" with the denser canisters, he should overlay a picture of a 747 onto the pad and see if there's ANY real protection whatsoever (I did such an overlay in one of my videos available on You-Tube). Instead, Victor's afraid "all the talk" about HBF has stifled the discussion about "trade-offs" and he seeks NRC guidance. Like, dude, the citizens OVERSIGHT group should not be seeking "guidance" from the group they are overseeing, which includes the NRC and CPUC at least as much as SCE and their subcontractors! You're supposed to be representing US, not THEM! Victor's third point is truly the words of a madman. Victor clearly doesn't want to understand that, as long as there is an operating reactor at a reactor site, there will be a waste dump there as well. Centralizing the "accumulating fuel" at a handful of sites would require overcoming enormous community/political/geologic/etc. hurdles, and would enable reactor companies to keep making more waste -- without having to spend the money for the long-term care of that waste. Yes, the issues are "particularly stark," as Victor puts it, at decommissioned reactor sites. But they are actually far more URGENT at operating reactor sites. 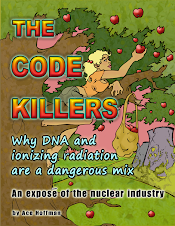 Victor claims to have studied the issue a lot in the past six months, including the Blue Ribbon Commission (BRC), whose sole purpose, as far as this author could discern, was to tell the federal government it had to force communities to accept nuclear waste through a process with the Orwellian name of "consent-based." The BRC's definition of "consent-based" relies on a small stakeholder (for example, an Indian tribe of less than a dozen people) making the decision to accept nuclear waste, and then prohibiting the larger communities around that spot from stopping the establishment of the waste dump. The BRC was less than useless: It suggested we destroy democracy in order to keep the nuclear industry going. And Victor LIKES the idea, suggesting that "large payments" to the host community is all it would take. Well, heck: Why shouldn't he think that? It worked in San Clemente, which has taken millions of dollars in bribes from Southern California Edison over the years, in the form of tax revenue, high-paying jobs for local residents, and most importantly, colorful booklets for the kids in local schools, booklets which say how wonderful and necessary and safe nuclear power is. Additionally, SCE makes direct donations to local environmental organizations to steer them well away from complaining about San Onofre, and to the local Chambers of Commerce to ensure their support as well. But once the plant stopped running, well, sooner or later so will the money (if it hasn't already). There will be no more colorful booklets, and not a word to the children about the spent fuel situation they will all inherit, that's for sure. Victor is worried that all this talk about "casking" and "emergency preparedness" has the "potential for large amounts of emotive language and amplified fears." He does not seem to know that all the horrors of Chernobyl or Fukushima -- or both put together and worse -- are locked up inside each of those dry casks he's supposedly helping to decide the future of right now. He's worried about political problems. He's worried about regulatory problems. He's worried about agitating the citizenry. He's worried about all the wrong things. He should be worried about the metallurgy. He should be worried about the fabrication processes. He should be worried about the lack of "defense in depth." There's just a single, solitary 5/8th inch thick layer of stainless steel between southern California and Fukushima, USA. David Victor SHOULD be worried about the final destination of the spent fuel -- but as chairman of the CEP, he should bring something more constructive to the debate than simply that we should accept that it's not moving any time soon, and we should bribe local communities somewhere else with "large payments" to get it moved. Note: In the original version of this blog, the author had remembered the BRC's Orwellian phrase as "community choice" rather than "consent-based." The error has been corrected in this document. Thank you for forwarding the letters. Victor's letters illustrate how an industry established "citizen engagement panel" intentionally derails the critical function of an informed public to defend their safety. In my opinion he should be removed from the CEP and someone like Daniel Hirsch who better understands the public interest should replace him. "Yet I continue to hear the same issues raised, including in public comment periods, even though substantial and serious attention has gone into examining them and making serious answers highly transparent to the public. All of us in this process have a larger responsibility to help people from diverse backgrounds -- most of them not experts on nuclear matters -- understand the REAL RISKS and tradeoffs. At the same time, all of us have a responsibility to focus on the areas of real risk and uncertainty and not on chimeras and red herrings..."
He views the public's concerns as fears of imaginary things and distractions. This is an insult to the hard work, information gathering, and intelligence of the public. He should be removed from the CEP. Fukushima IS an illustration of a chimera (a monstrous fire-breathing hybrid creature composed of the parts of three animals) seismic, tsunami, nuclear meltdowns, previously believed too improbable to ever happen. The key lessons of Fukushima seem to escape Victor as do the basic mechanisms and necessary function of REAL PUBLIC INVOLVEMENT. He has no right to be representing the local public at the NRC especially if he characterizes valid public concerns as "a distraction". He clearly represents SCE and SDG&E and that should be made clear to the NRC so that decisions made by the CEP do not become official NRC record of public consensus. David Victor is even worse than I've described here! He's an apologist for SCE and the nuclear industry. There is no way it's appropriate for him to chair the "Community Engagement Panel" since he cuts off other speakers, hogs the time for himself, asks inane and irrelevant questions, and steers the program only in directions he prefers. He's more of a dictator than a chairman.